After the builders have left, you may find your carpets and upholstery looking a little worse for wear. AB Cleaners carpet and upholstery cleaning service specialises in the deep cleaning and refreshing of all fibres and fabrics. 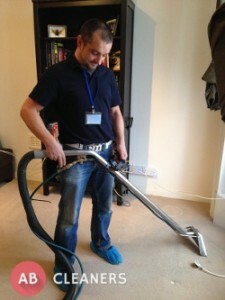 Our team of highly qualified and knowledgeable technicians will get your carpets cleaned to the highest standard. We only use family and pet-friendly cleaning products and the latest equipment. We’ll treat your carpets gently yet effectively. Any stains will be pre-treated and assessed. Our consultants understand which treatments benefit each carpet type. They will expertly assess and choose the right ones for you. We’ll dry clean or use hot-water extraction methods. Steam cleaning is also an option. This thorough deep cleaning will ensure your carpets and upholstery will look as good as new. Any marks or stains caused by the building work will be specially treated. Delicate fabrics will be granted the utmost care. Our consultants are all fully insured. We’ll also offer the best advice in maintaining your carpets in the finest possible condition. Protective solutions can be applied to prevent future staining. We don’t use products that can be bought over the counter. 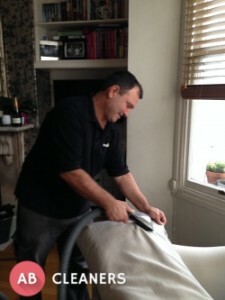 Why Use Our Carpet and Upholstery Cleaning? Furniture moved and moved back! We’ll also provide you with a wide range of other after builders cleaning services. 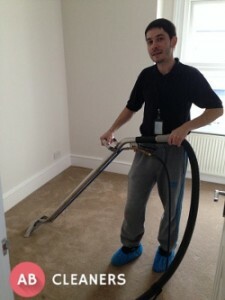 Hire Our Tailored Cleaning Service Today! Call our friendly customer sales team now on 020 3404 1927. Our lines are open 24 hours a day, 7 days a week. Ask for your no-obligation quote. We can arrange an appointment that is convenient for you. If you need an evaluation from one of our technicians, then call our sales advisers today. AB Cleaners offer booking slots that cover weekdays, evenings and weekends. Alternatively, you can fill in our contact form, or if you prefer use our website’s chat facility for a speedy response from one of our experts online.